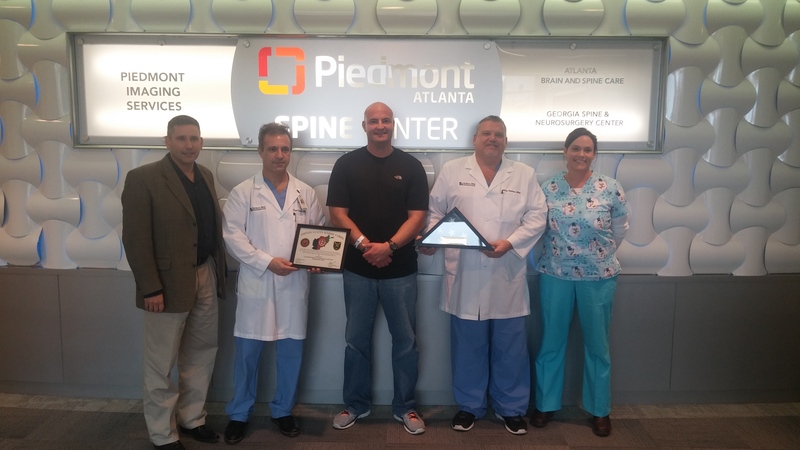 Here at Georgia Spine and Neurosurgery Center, we have the pleasure of treating patients but also meeting and getting to know the stories of the many different types of people that walk through our doors. One of our patients, Staff Sargent Eric Brand, is an airborne qualified, United States Marine from Florida. He has served valiantly in Desert Storm, Somalia and Afghanistan on various humanitarian and combat missions. In the spring of 2013, Staff Sargent Brand suffered an injury while repelling out of a helicopter during a training assignment. This unfortunate incident left him with a fracture in his leg that also caused severe damage to his spine and nerves. As a result, he endured debilitating pain, weakness and numbness that permanently threatened his quality of life. With the help of his Lieutenant Colonel and Commanding Officer (Lieutenant Colonel Kerwood) of 4th Angelico, Mr. Brand traveled to Atlanta from Florida and finally sought treatment with Dr. Khajavi in May 2014, and surgery was promptly scheduled thereafter. The minimally invasive, XLIF procedure was recommended and successfully executed by Dr. Khajavi, Anthony Hutchison (NP) and team.